I haven’t updated Documentary Evidence for a while but that’s not because I haven’t been busy with other writings. 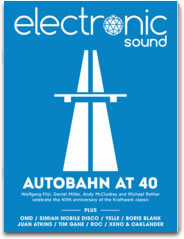 The latest edition of Electronic Sound for iPad is now available. This issue features my reviews of Erasure‘s excellent album The Violet Flame, Olivia Louvel‘s mesmerising Beauty Sleep (featuring one track based around a sample of Recoil‘s ‘Stone’) and a major interview with Simian Mobile Disco about their new ambient album Whorl. Issue 8 also includes a feature on the fortieth anniversary of Kraftwerk‘s ‘Autobahn’, which includes input from Mute‘s own Daniel Miller. To read more go to the Electronic Sound website. Just lately I’ve found myself spending some time at the Milton Keynes concert venue that’s literally on the doorstep of the village in which I live (The Stables) and in the last month I’ve reviewed three gigs at the venue. This marks something of a tentative return to reviewing gigs after a long break. The first was something pretty special for me – Nik Kershaw, whose solo acoustic show I reviewed for This Is Not Retro. Kershaw’s music was what I grew up with and Human Racing, his first album, was the first album I ever owned. My review for that concert, with photos from the Worthing gig on the same tour by my good friend and talented photographer Andy Sturmey can be found here. I’ve also written two pieces for a local Milton Keynes site – TotalMK – of my other two recent Stables gigs. Dylan Howe’s Subterraneans found the jazz drummer performing pieces from Subterraneans, which sees his band work through jazz versions of tracks from David Bowie’s Berlin period. Howe is a hugely talented drummer who has worked with many different acts in the jazz and rock world, including Nick Cave, for whom he drummed on songs to the soundtrack for I Am Sam with The Blockheads. The other Stables gig was Tom Baxter, well known for getting picked by movie and TV producers when a stirring song is ever required for a soundtrack. As well as that little lot, you’ll continue to find my reviews in Clash each month – the latest issue includes a piece of mine on the latest Thurston Moore album, which is more than likely the closest we’re going to get to a classic Sonic Youth LP anytime soon.